Packing to go anywhere can be a chore, especially when your goal is for one bag to serve multiple people in the family. 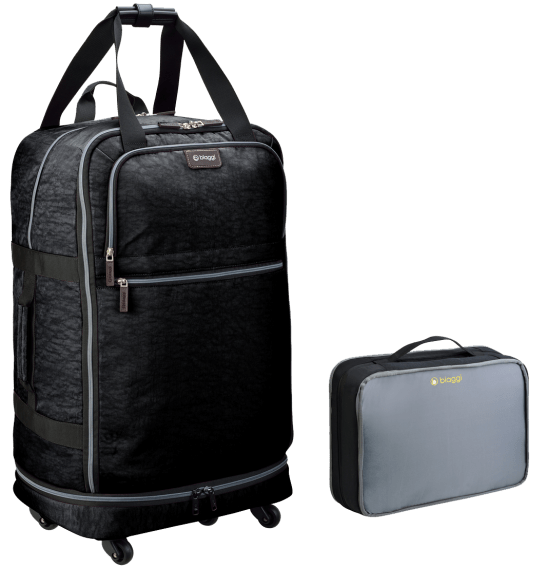 Most times I tend to over pack even for just myself, so when I received Biaggi’s 31″ Foldable Spinner Duffle, I decided to put it to the test! Who doesn’t like experiments, right?! My experiment: 1. How much stuff can I easily fit into this duffle, and 2. Is it tough enough to not burst at the seams? I can tell, you’re on the edge of your seat! But first, the specs. I selected the purple Biaggi so none of the sweet men in my life would be tempted to steal it from me. Yes, I’m mean like that. My darling daughter, however, thinks it’s her new Princess Bag, so I see some squabbles in our future. All kidding aside, I absolutely LOVE the color, function, ease of use, and size of this duffel! At night it’s a more muted purple than the color represented on the site, giving it a sophisticated albeit youthful vibe. I set it next to the table when my kids were doing some crafts and while they ate, and I could easily wipe their spills off with a damp rag. When not in use, or after unpacking on a trip, it is extremely compact and folds to a very small 14” deep by 18” wide by 5” tall. For all you non-engineer friends, that’s about the size of a briefcase! Now, how much stuff can I cram into it? As I mentioned earlier, I tend to over pack. I wanted to find out, if I went away for a long weekend, could I fit all of my stuff into it? So, I packed. Then I packed some more. Then I realized I had way too much room left so I added my kids’ clothes too. Guess what?! It all fit! I can easily fit my clothes and my five children’s clothes in this one bag AND there was room left! I can say with full confidence that it would easily fit enough clothes for one person for one week, maybe even two. 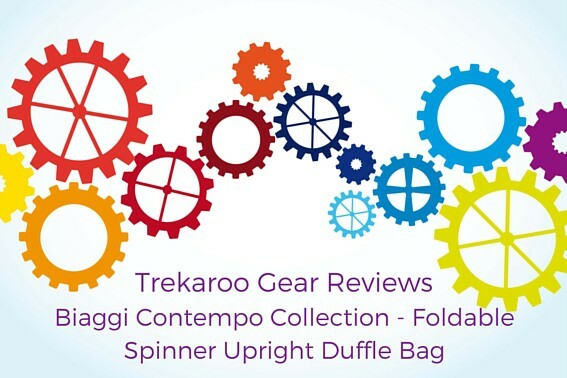 Tip: Read expert packing tips from Trekaroo families! We love this bag! It is perfect for any occasion you need to pack for: camping, resort stays, checking on airplanes, etc. Plus, it takes up barely any room in your closet so it’s really easy to store it when it’s not in use! This luggage is pretty affordable, starting at around $95.00. Disclosure: I received a complimentary Biaggi Duffle for the purposes of this review. All opinions are my own.